It’s a simple equation: the more skilled and knowledgeable your technicians are, the greater your fleet’s uptime is. And when you partner with Hooper, we provide your technicians with the advanced training they need to keep your lift trucks up and running at maximum efficiency. With both classroom and hands-on courses taught by certified trainers, you are guaranteed to learn from the most experienced technicians in the industry. 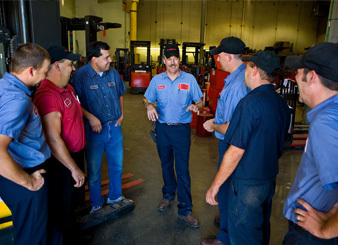 From the comprehensive electrical, mechanical, hydraulic and service skills necessary to maintain powered industrial trucks, to keeping up with recurring advancements in technology, we enable your technicians to maintain the proficiency they need to protect your lift truck investment today, and into the future. We also make it easy and convenient for them to get the training they need by offering courses at our facilities or yours, and also provide consultation services and custom programs that are designed around your team’s – and fleet’s – needs. For more information about our technician training programs, please contact us today.